Streptocarpus is a large genus native to southern Africa. Subgenus Streptocarpus is comprised of plants with typically strap-like leaves which grow either from an irregular rosette with several leaves emerging directly from the ground; or as a single leaf, the only leaf the plant will ever produce. Subgenus Streptocarpella produces more conventional looking plants with stems, leaves and flowers arising from the leaf axils. All the species we’ve known as Saintpaulia (African violets) are now Streptocarpus. Be sure to read Dr. Jeff Smith’s article on this web site for updated information. The habitat in southern Africa varies widely. 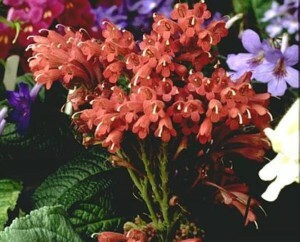 Streptocarpus grow in mountains, along streams, and many grow in rock crevices. Some need deep shade and others thrive in sun. During drought or cold extremes, survival of the plant is by means of the leaf tip dying back to an abscission line. Success by the hobbyist in growing Streptocarpus species is improved when research is done to see how they grow in their native environment. Wick watering, where the soil is constantly wet will not work well with the dry forest species like S. kentaniensis. Streptocarpus lilliputana grows along streams, so if the hobbyist allows the plant’s roots to dry for five or so days, it may totally collapse and all but the center of the plant dies. Most of the rosette species are perennials and are found in groupings. There can be variation in flower color and throat markings even within the same species. The rosette forms of this genus have been much hybridized and are very popular ornamental plants. In general, they prefer coolish temperatures and will not do well during hot weather. They should be planted in a relatively open and well-drained medium that is kept evenly moist, never continuously wet. They tolerate short periods of drought fairly well. Monocarpic species may take 18 months to 2 years to grow before they bloom, set seeds, and die. Although some will only have a single leaf, others produce smaller secondary leaves that produce a few flowers before the plant dies. When used in hybridizing and crossed with rosette-shaped plants, about 50% will have multiple leaves from the start. About 25% of the seedlings will be monocarpic. Another 25% will initially appear monocarpic, but will then produce more leaves after the main leaf has finished blooming. In nature there is a season for blooming. When species are grown by the hobbyist in greenhouses or indoor situations with window light, the seasonal blooming is obvious. As the days become shorter, the number of flowers decreases with no flowers during winter. When species are grown under tube light, there’s an abundance of flowers for several months in the spring through summer and the rest of the year has sporadic blooming. Some species even under tube lights will not ripen seedpods for four or five months, as if waiting for late winter/early spring to drop seeds for the new growing season. Often the first generation of species x hybrid results in seedlings with seasonal blooming. Some species have scented flowers including S. fanniniae, S. candidus, S. wilmsii, and S. vandeleurii. Scent ranges from sweet to smoky-creosote. Hybridizing for scent with S. vandeleurii has shown about 50% of the seedlings have scent. Crossing sweet smelling S. candidus with smoky-creosote S. vandeleurii resulted in a sweeter, smoky scent. Streptocarpus initially produce a green seedpod that lengthens over a two-week period. It has a spiral appearance and when the pod ripens in 8 to 16 weeks, it turns brown and the spiral’s purpose of untwisting is seen. Hundreds of brown seeds are produced. Sowing seeds in nature means they scatter on top of the ground. When growing from seed, it’s best to spread the seeds on a moist but not soaking wet, soilless medium. Don’t add more mix on top of the seeds. Cover the container and you’ll see sprouts within 3 to 8 weeks. Propagation of Streptocarpus is quite easy with leaf cuttings. Leaves can be cut into 5 cm (2″) sections and placed into a soilless mix. Leaves can also be cut horizontally with the mid-vein removed. Propagation in spring and summer produces new plants within a couple of months, but fall and winter propagation is much slower. When young plants’ leaves are around 5 cm (2″) tall, they can be pulled away from the mother leaf and separated. The key to success is putting the young plants into small pots and not placing them too deeply into the soil.